Thank you! The food was great! You guys always do an amazing job all-around. The experience was a good one - from the ordering, the delivery and the quality of the food. The only thing I think could be better is the amount of dressing (for salad) and sauces (for meat) included with the order. What was provided definitely wasn't enough for an order that size to feed that many people. We ran out pretty quickly and had to run to the store to buy more. Lighten up on the nutmeg in mac and cheese. Takes the southern taste out. Your blend of cheeses was amazing. Food was excellent. Great, friendly staff! We love Lazy Bones at GM Tech Center!!! Delivery was right on time, large amount of portion sizes and food was hot!!! We went to The Folwling Warehouse for a small work get together and had LazyBones delivered. Jackie, the manager, was so nice and was there to answer all of my questions. The food was delivered right on time. The hot food was still super hot and the cold food was still super cold! Everything was absolutely delicious. 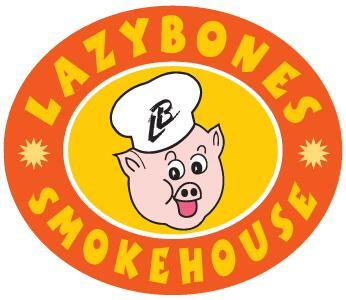 I highly recommend LazyBones!!!! Just did another Pickup catering. We're a BBQ Caterer that just served them our St. Louis Pork Spare Ribs - Full Slab. Just did another Pickup catering. We're a BBQ Caterer that just served them our Pit Smoked Beans - 1/2 Pan, Steamed Fresh Vegetables Full Pan and Baked Macaroni & Cheese - Full Pan. Birthday catering for 9 guests. We're a BBQ Caterer that just served them our Carolina Pulled Pork -5 lbs, Pit Smoked Beans - 1/2 Pan and Bacon Fried Rice - 1/2 Pan. Delivery catering for 35 guests. We're a BBQ Caterer that just served them our Three's Company Package - Drop Off with Pit Smoked Beans, Steamed Fresh Vegetables, No Additional Side and No Additional Cold Side. Other catering for 30 guests. We're a BBQ Caterer that just served them our Pig Candy- By the Pound, Three's Company Package - Drop Off with Baked Mac & Cheese*, Garlic Parmasan Fries*, No Additional Side and No Additional Cold Side, SMALL-Assorted Cookie and Brownie Tray, Fruit Salad (Large Bowl) and Vegetable Tray. Just did another Pickup catering. We're a BBQ Caterer that just served them our Baked Macaroni & Cheese - Full Pan, Yukon Gold Potato Salad - Full Pan and Baked Macaroni & Cheese - Full Pan. Just did another Delivery catering. We're a BBQ Caterer that just served them our Texas Beef Brisket - 1 lb., Pulled CHICKEN - 1lb, Jackfriut/Per Pound, Baked Macaroni & Cheese - 1/2 Pan, Garden Vegetable Salad - 1/2 Pan, 1 Dozen Slider Buns and Peach Cobbler - 1/2 Pan. Delivery catering for 35 guests. We're a BBQ Caterer that just served them our Three's Company Package - Drop Off with Pit Smoked Beans, Baked Mac & Cheese*, No Additional Side and No Additional Cold Side, Peach Cobbler - Full Pan and *Pig Candy Half Pan- 5lbs*. Just did another Pickup catering. We're a BBQ Caterer that just served them our Kentucky Smoked Chicken-100pc, Honey Buttered Cornbread - Full Pan 50 pcs, St. Louis Spare Ribs - 100 pc, St. Louis Spare Ribs - 100 pc, Homemade Mashed Potatoes w/ Chicken Gravy Full Pan, Green Beans with Onions- Full Pan, Caesar Salad Full Pan and Caesar Salad Full Pan. Delivery catering for 50 guests. We're a BBQ Caterer that just served them our One Meat Package with Bacon Fried Rice, Broasted Ranch Fries and None. Delivery catering for 14 guests. We're a BBQ Caterer that just served them our Texas Beef Brisket - 1 lb., Carolina Pulled Pork - 1 lb., Baked Macaroni & Cheese - 1/2 Pan, Green Beans with Onions 1/2 pan, Piece of Cornbread and Quart of Vinegar Garlic Slaw. Just did another Delivery catering. We're a BBQ Caterer that just served them our St. Louis Spareribs-50pc, Kentucky Smoked Chicken-100pc, Southern Collard Greens - Full Pan, Bacon Fried Rice - Full Pan, Honey Buttered Cornbread - Full Pan 50 pcs, Memphis Cob Salad Individual, 2 Liter Faygo Beverages and Plate and Plastic Ware Set-Up. Delivery catering for 40 guests. We're a BBQ Caterer that just served them our Three's Company Package - Drop Off with Baked Mac & Cheese*, Sweet Potato Casserole, Southern Collard Greens and No Additional Cold Side and Banana Pudding - Full Pan. Employee Appreciation Luncheon catering for 42 guests. We're a BBQ Caterer that just served them our Three's Company Package - Drop Off with Baked Mac & Cheese*, Green Beans with Onions, No Additional Side and No Additional Cold Side. Just did another Delivery catering. We're a BBQ Caterer that just served them our *Pig Candy Half Pan- 5lbs*, St. Louis Spare Ribs - 100 pc, Kentucky Smoked Chicken-100pc, Baked Macaroni & Cheese - Full Pan, Pit Smoked Beans - Full Pan, Honey Buttered Cornbread - Full Pan 50 pcs, Garden Vegetable Salad - Full Pan and Texas Beef Brisket -5 lbs.